We identified 6 key activity areas in which project management software is used and also identified many different vendors’ solutions which are used in one or more of these activity areas. When prompted, construction contractors’ highest awareness was for the following three products: Autodesk BIM 360, Prolog and Bluebeam. 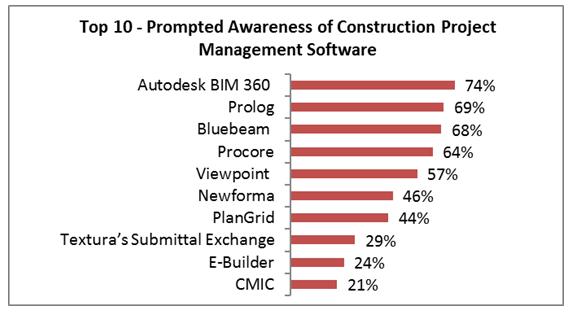 Overall findings from discussions with software users as well as vendors show that Bluebeam, Prolog, Procore, Viewpoint, PlanGrid, and Autodesk BIM 360 are the leading project management solutions in the US mid-market construction sector. Surprisingly, only 3% of organizations use just one construction management software solution across all activities. 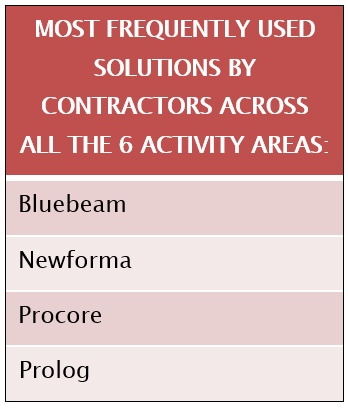 Those 3% of organizations are using Bluebeam, Newforma, Procore and Prolog across the 6 activity areas. Construction project management software solutions are typically used in conjunction with general business software, for example, 52% use email for some activities and 32% use Microsoft Excel for some activities. Users are looking for cloud based technology providing mobile access to data. Efficient communication, a single data storage place and access to it at any time from any location are the main triggers for consideration of construction project management cloud based solutions. 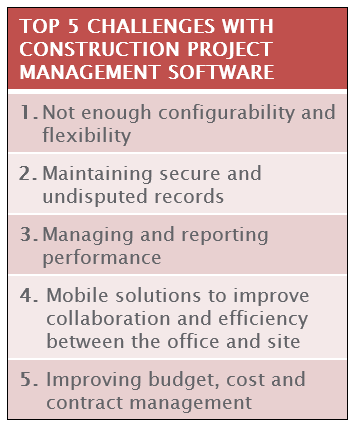 Senior management typically makes the final decision to purchase construction project management software. However, project managers, CFOs/accounting and department heads can all be involved or influence the purchase decision. IT is involved in the decision at almost half of the general contractors we interviewed. Software vendors that we spoke with also tend to encourage their clients to involve multiple teams in the decision-making process. According to the software vendors, it takes companies about 6 months (on average) to make the final decision. Following research with both construction project management users and software vendors, we ranked the biggest challenges that users have with project management software in the mid-market construction sector. Above all, construction companies are looking for a software solution that can be flexible and easily configured. General contractors in particular are looking for a ‘single source of truth’ – where all information is stored in one place, with the correct version and can be accessed by multiple project stakeholders. Satisfaction with construction project management software solutions is generally high; however, PlanGrid scores consistently higher on all of the 6 key activities. Ability to improve communication and collaboration was one of the key reasons for user satisfaction. Mobile access to data was seen as a key strength by some leading software vendors. In-depth telephone interviews with vendors of project management software. Subscribe to this blog for regular research updates. If you are interested in specific analyses of the construction project management research data give us a call to chat with a research executive about your needs. You may also be interested in our CAD Trends in AEC 2017 report based on the Annual Global CAD Trends 2017 survey. This report is a detailed analysis of 15 CAD Trends within the AEC segment – and covers which trends are strongest and where, what growth is expected and where awareness of trends leads to actual usage. It also contains many deep insights specific to the AEC sector. 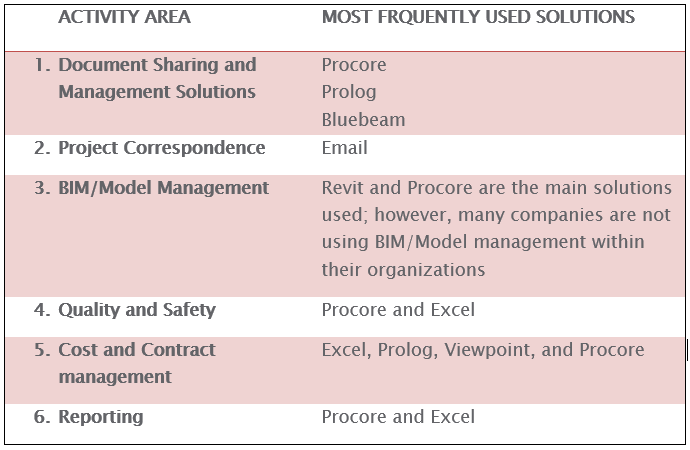 The 6 activity areas mentioned above are very crucial for clients and BIM service providers. Companies need to educate and inform their employees on the usage of various software’s and make it a software independent enterprise. Software skills are vital for BIM companies at this point of time.